In 1909, EM Forster wrote the astonishingly prescient novella The Machine Stops. It tells the story of Vashti (Caroline Gruber), who lives in a tiny underground cell where information is available at the push of a button, where people communicate through video screens, and where actual human contact and travel are frowned upon. A century before such things became reality, Forster effectively predicted Skype, the internet and even Siri. Juliet Forster’s production relies heavily on music and movement to bring this dystopian vision to the stage. The electronic score, provided by former Ultravox frontman John Foxx, is incredibly evocative, from the Darth Vader-style breathing effect when you walk into the auditorium right up to the clanking, chaotic cacophony at the climax. 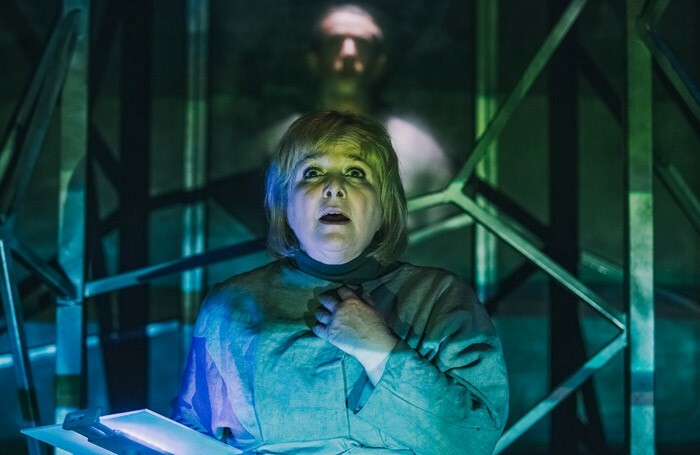 While Foxx’s score plays, Maria Gray and Gareth Aled represent the cogs of The Machine, intertwining with each other as they clamber all over Rhys Jarman’s claustrophobic scaffold of a set to provide Vashti with her every need. It’s only when Vashti’s son Kuno (Karl Queensborough) warns her that The Machine is in danger of breaking down, that the perils of such reliance are brought into sharp focus, leading to a bleak but somehow still touching conclusion. At 90 minutes, it could possibly do with some tightening up, but Philippa Vafadari’s engaging choreography keeps things moving at a fair pace. It’s a chilling warning of the dangers of losing sight of our own humanity – yet, as the many smart phones blink into action as the house lights go up, whether that warning will be heeded is anyone’s guess.